New Delhi: Ahead of India’s 67th Rupublic Day, an emotional Sachin Tendulkar on Sunday said that singing the national anthem in front of a packed Wankhede Stadium before the 2011 World Cup final is the “proudest feeling” he has ever had in his life. Besides being a sporting icon, the batting legend is known for his exemplary duties towards the nation, which includes many social works. And describing the moment in his own words, Tendulkar provided an altogether different charm to the events which unfolded on that fateful day on April 2, 2011. “But it (singing of national anthem) goes to a different level altogether, when you are playing against Pakistan in 2003 World Cup (in Centurion), standing inside the stadium, in the middle of the group, with 60,000 people singing ‘Jana Gana Mana’,” he said. The 42-year-old was speaking at the unveiling of the album ‘The Sport Heroes’, which features himself, and hosts of other Indian sporting icons. 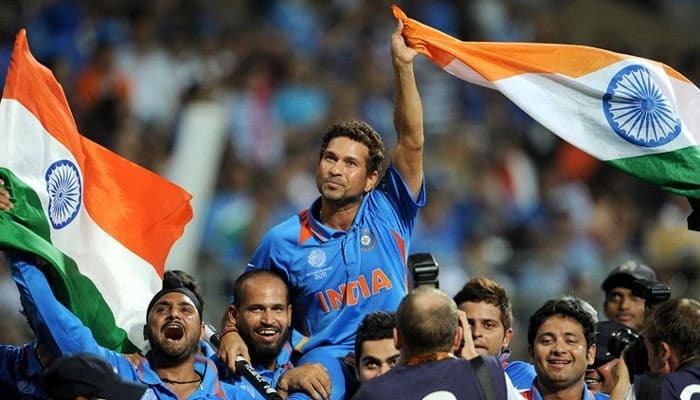 “When you sing the ‘Jana Gana Mana’, your head is always held high, but when you sing it (standing) in the centre of the ground, then…seena chauda ho jata hai (chest swells with pride),” Tendulkar said. “A couple of experiences, one was that (against Pakistan). The other one was when we played the 2011 World Cup finals, I can never forget that experience, the entire stadium singing ‘Jana Gana Mana’ and it still reverberates in my ears. It’s the proudest feeling I have ever had in my life,” the master blaster said. “We achieve so many personal goals, also team milestones are achieved, but when its comes to our national anthem, everything else takes a backseat,” he feels. The video “The Sport Heroes”, directed by Abhijit Panse, features the national anthem sung by – Sachin, Sunil Gavaskar, Sania Mirza, Mahesh Bhupati, Dhanraj Pillay, Baichung Bhutia, Gagan Narang and Sushil Kumar. It was launched by International Institute of Sports Management, which is founded by former India and Mumbai cricketer Nilesh Kulkarni.